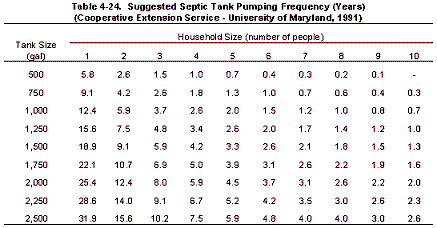 This chart below, quoted by EPA, will give you an estimate of the required frequency for pumping your septic system. * Many aerobic system trash tanks are much smaller than 500 gallons. NOTE: More frequent pumping is needed if you use a garbage disposal or the thick multi-ply toilet papers. Septic tanks don't fail immediately if they are not pumped. The tanks will, however, continue to fill with solids and may back up sewage in the house, or accelerate failure of your components downstream. It is much cheaper to maintain your system than repair (or replace) it. ...replacing just the septic field could cost thousands of dollars or more. ...replacing your entire system often costs tens of thousands of dollars. Providing Quality Service...Guaranteed In the Greater Austin Area of Travis, Hays, Williamson, Burnet, & Bastrop Counties , Jollyville, Creedmoor, San Leanna, Bear Creek, Kyle, WoodCreek, Coupland, Florence, Jollyville, Bell County, Misc Locations.